Pascal Rogé makes a rare detour on disc from his French music niche in his first Mozart Concerto disc ever, released to coincide with the 250th celebrations. 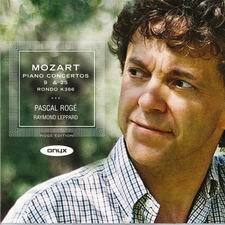 In fact, Rogé plays these concertos in concert very frequently. Rogé’s last concerto disc received rave reviews (Gershwin and Ravel Concertos on Oehms), as did the first volume of his complete Debussy (ONYX4004). Outstanding collaboration with Baroque and Classical specialist Raymond Leppard who was chief conductor of the Indianapolis Symphony from 1987-2001 and is currently its Conductor Laureate. A generous 75 minute programme featuring Mozart’s astounding youthful masterpiece the ‘Jeunehomme’ concerto with the grand symphonic C Major Concerto K503 of 1786, the ‘Coronation’. The A Major Rondo of October 1782 completes an attractive programme of early, middle and late Mozart concertante works.